Hashing It Out | Constructing My Own Little World, One Word at a Time. Although chapter 7 of Stormrider already existed, it was a hold-over from an earlier form, when the book was called Eomund. After taking a new approch, part of which involved writing more chronologically (rather than the random disjointed scenes), I found myself and the story at an impasse with the previous occupant of chapter 7; “Goblins Enter the Land”. I knew this was coming, and I dreaded it. Not so much for the fact that I would be completely removing the existing text. After all, that chapter wasn’t well received by readers and I didn’t really care for it myself. No, the problem was I had the new version in my head for some time and just didn’t know how to get it down on paper. Even know, after forcing myself to type out the blasted thing, this draft feels clunky and disjointed. But I knew at some point it had to be written (there would be no story progress without it). There was no jumping past it. There was no ignoring it. So I wrote it. I’m not terribly happy with it, but what I am happy with is the fact that it’s out there in the world. It had had more than enough time making its rounds in my brain. It was no longer doing either it or myself one bit of good up there. Sometimes you just have to clear the clutter to make room for more (kind of like on Horders). So, write; clear the cobwebs, because something (hopefully more exciting) will take it’s place. If you want to see what this looks like in action, have a look below. So, I’ve been getting a lot of writing done lately. Churned out two more Stormrider chapters in two weeks, and am nearly done with a third. Today, I was thinking of chapter titles. I’m generally lazy about making them, resembling brief description rather than witty title. I feel they should be given more than just a passing descriptor. PekoeBlaze has some really good suggestions for coming up with fun and relevant chapter titles. If you’re like me, you’ll find this post extremely helpful. 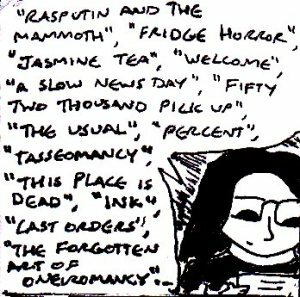 Well, since I seem to be writing an episodic novel/novella at the moment (it’s called “Liminal Rites”and it can be found here – it’s also updated every night at 22:30 GMT) – I thought that I’d write an article about coming up with good chapter titles. The art of writing chapter titles seems to be going into decline slightly these days and many novels (or at least the ones I’ve read) just have chapter numbers and nothing else. Still, I feel that well-written chapter titles can really add a lot to a story for several reasons. Like the title says, the latest chapter of Stormrider is up and ready for viewing (on Wattpad)! Being a writer working on a fantasy novel, I often think how nice it would be to have a quality narrator read my story aloud. Obviously, no one of a professional grade is going to sit down and record narration for chapters on my unfinished book. But I’m impatient, darn it! So, in this age of technological wonders, I turned to text-to-speech software. When I initially tried text-to-speech software years ago, I was left somewhat unimpressed by the more accessible (i. e. cheaper) options. I did like a couple of the more expensive software suites, but after the trial period was over I was left out in the cold. Fortunately, text-to-speech software has come a long way in the past ten years or so, and even the standard installations that come with most computers now are pretty descent. One piece of software I’ve come across recently is actually an iPhone app. Called NaturalReader it’s a rather powerful little app with quite a selection of voices from which to choose. While I do have a couple of issues with the app (namely that you have to be online to use it, and the fact that you cannot directly save the audio to a file) it’s still my go-to app for listening to my stories. I find using the app is good for proofing as well as making revisions. Often times, a sentence might look fine on paper, but sound awkward aloud. This gives me the chance to further refine the text in a way I might not otherwise. I’m now seriously considering posting new chapters in audio form to YouTube concurent with their release on Wattpad. I am going to go ahead and post a chapter or two and see how things go. Maybe this will be another way to garner more attention to my stories. The first chapter of Stormrider can be heard HERE. I went with the first chapter instead of the Prologue because it’s generally more digestible for most people. Having resurrected this blog, I felt it was also incumbent upon me to do some revamping to the content of this space. Originally, I think I was going to devote this space to my prop replica hobby. But being short on funds and time, there was no way to do that consistently So, I fell back to Plan A and my original passion of writing fiction–peppered with bits of everyday wit and whatnot. In addition to this space being my blog, I’d like for it to be a hub for my web-presence. Look at it as a landing page of sorts, or an airport terminal with connecting flights to Works of Fiction, Illustrations, Videos and more. Thus, you might notice some new pages added as well as old ones gone. So, have a look around, and pardon our dust. After discussing with my fiancee, Ashley, my recent post on building a web presence in the event of publication (provided I ever finish a whole book), she decided to finally take the plunge and start a blog of her own. Now, you have to understand, Ashley’s not the Internet junkie that I am. She’s more of the curl up with a good book type. Fortunately, she plans to use this to her advantage. You see, her blog will consist almost entirely of book reviews. You should expect to see reviews quite regularly, because this girl can go through a book in no time flat. She plans to read her first book, Island Girls: A Novel over the next week and then publish her review. Expect to see that soon. In the mean time, it wouldn’t hurt to go ahead and send a follow her way so you’ll know when the first review drops.